As part of Green Lead's recent acquisition of Target 250, a portion of our European team is based in Ireland. Linda and I are here this week working with the team on transition issues, and while heading out for dinner last night we walked by the Bank of Ireland in the center of Dublin, where President Barack Obama's gave a speech just a few weeks ago. Brand - Obama has a solid understanding of Branding. Every word, action and event is organized with a consistent brand of quality and authority. Stay on target with all your brand messaging. Opportunity - I'm not sure who planned their trip first, but the combination of the Monarchy and the US Presidency visiting within weeks of each other was a one-two punch for both. The buzz from our colleagues in Ireland is one of progress, respect and excitement from the two visits. Take advantage of opportunistic moments as it pertains to marketing. Disruption - Be it the President shutting down the Dublin airport and delaying my Irish team from flying to Andover, or you making a disruptive sales or marketing statement, consider your messaging and consider the impact of authority and disruption to the norm. The market reacts to this and it allows you to stand apart from the crowd. Dress to Sell - If you are not sure of the casual nature of a sales or marketing event, you'll never go wrong in an Obama class suit and tie. I was recently at the SiriusDecisions Summit in Scottsdale and although the crowd was predominantly in business casual attire, suits and ties for men and suits for women were not uncommon--especially for the sales types. If you opt for a blazer, just make sure you have the best looking shirt/blazer combination in the room. Keep the golf shirts on the golf course. Even the ones with logos on them. ...and a snapshot for the photo album. 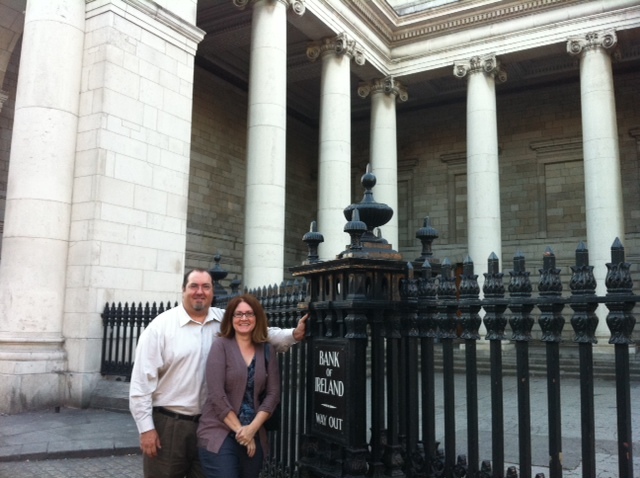 Linda and I in front of the Bank of Ireland in downtown Dublin, right where Obama spoke. 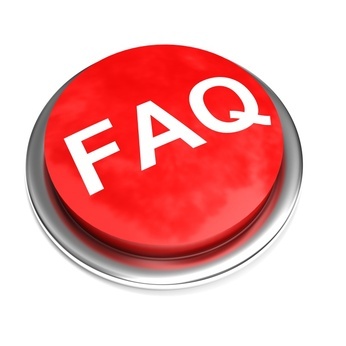 FAQ: What does the Green Leads acquisition of Target 250 mean to you? What was the acquisition about? Green Leads has grown by a factor of 2X each year for four years running. In a bad economy, that's a feat. We looked at 2011 and realized that one way we could grow by 2X again was to do it through acquisition -- but only with the right partner. Expanding our service in the EMEA markets as well as growing our business in North America were priorities. To achieve this, we decided the most efficient path was to add a company to Green Leads' team that had the fundamentals needed to deliver quality demand gen services to our clients. Target 250 not only has those qualities and a dominant position in the European market, but also provides services in North America. So we got both European expansion and North American growth in one package. On May 4th, we grew by 2X again -- in one day. What does a European and North American presence of Green Leads mean to me? As demand gen professionals, you now have a one-stop shop for both sides of the Atlantic. You can work with one program manager, and in many cases, the same Green Leads reps. The same reporting, data management and quality standards will exist in both locations. And in most cases you can have one contract and invoicing source, simplifying your management of two programs. Will Target 250 stay the same? The logo and the email addresses will change. Then, as we blend the two companies' best practices, you should see a noticeable increase in the level of service from a production, delivery and quality standpoint. Commercially, we will novate the existing contracts over to Green Leads contracts. This may take a few months. Will our service level change? In general, the only differences in service you should see are improvements. Over time we will implement some process enhancements and share best practices; we are hoping both Green Leads clients and Target 250 clients will benefit from the marriage. In the near term you will notice that we will be launching a new Client Portal tied directly to our Salesforce back-end that will allow you to view program reporting, upload new target lists, provide meeting/lead feedback and review activity. As a Green Leads client, what does this mean for me? Our services will only get better and our offerings will expand, including the ability for you to work on both sides of the Atlantic with one single point of contact and 7 supported languages (English, French, German, Spanish, Russian, Swedish, Arabic). As a Target 250 client, will I be getting Green Leads invoices now? As the transition matures, you will definitely start getting Green Leads paperwork. Some of this relies on our converting contracts and legal documents over to Green Leads. This will take a bit of time but is a priority for us. One benefit of the merger is that you will now have the option of being invoiced from the U.S. or Europe. This can be beneficial to your procurement process, budgeting and logistics. Who is my main contact with the company? Will my reps change? Your current liaisons will remain the same and other than normal project resource allocation changes your reps will remain the same. Our intent is to make the transition as smooth for our clients as possible. Will pricing and/or pricing model change? In the short term, no. Over time the answer is yes. As it pertains to appointment setting, Target 250's business model was to sell contract commitments with a volume of meetings agreed to and then invoice for meetings when they were set. Green Leads' model eliminates the word "campaign," structures open-ended contracts and then invoices for meetings when they are attended and meet the service level agreement (SLA) criteria agreed to by both companies. We will eventually migrate all appointment setting models to the Green Leads format. We currently get face-to-face meetings, yet I've heard the U.S. does a lot of conference calls, is that changing? The U.S. is more accustomed to making the first introductory sales call by phone. We actually studied it a couple years ago and found that 69% of respondents found a phone meeting satisfactory for the purposes of an introductory meeting. Understanding that in the U.K. and other European locations many prospects are just a drive or train ride away, face-to-face still makes sense. We're not going to push our clients one way or the other, but we definitely will recommend that you consider the option. The results are typically: no change in the outcome of introductory appointments (they have the same effectiveness), and sales execs can spend less time travelling and more time selling. Give it a shot, and measure the outcome. Should you have any further questions, please post them here. SCOTTSDALE, AZ (Marketwire – May 4, 2011) – Today, at the SiriusDecisions Summit, Green Leads announced the acquisition of Target 250 to form the fastest-growing pay-for-performance demand generation company in the industry. The companies are combining to provide global enterprise software and technology companies with deeply integrated quality pipeline generation programs in both North America and Europe. "We've focused laser-like on developing robust, repeatable processes which we think are best practices in the industry. We've doubled in size three years in a row and Green Leads has been able to break the mold on integrating with our customers’ go-to-market and pipeline generation initiatives to deliver material top line results,” said Green Leads CEO, Michael Damphousse. “Our clients are demanding that we expand our delivery to the EMEA theater, which triggered the acquisition of Target 250. “Target 250 has both the core expertise and an exceptional client roster to create an immediate value for our joint customers as well as new prospects looking for an integrated extension to their sales and marketing channels,” Damphousse said. Green Leads and London based Target 250 focus exclusively on software and technology companies that sell strategic b2b enterprise products and services in North America and Europe. Green Leads now will be able to provide its sales and marketing clients with a single source of investment for appointment setting, lead nurturing, market research and other demand gen best practices.